Adventure Partners knows success is built upon the excellence of ours guides. Their talent for sharing stories while looking after the well-being of our guests elevates and secures the experience. In Southern Utah we work in a rugged landscape of mesas and canyons, where geological history spans almost two billion years and each sedimentary layer has its own tale of creation. Great vertical spaces can suddenly impede forward progress and present challenges which bring this compelling environment into sharp focus. Guides’ training is an ongoing investment undertaken to enhance our interpretive skills. It may also advance a larger “tool kit” of technical expertise for managing the inherent risks of travel through complex and exposed terrain. Command of Place is a creative process requiring continuing education and re-invention. 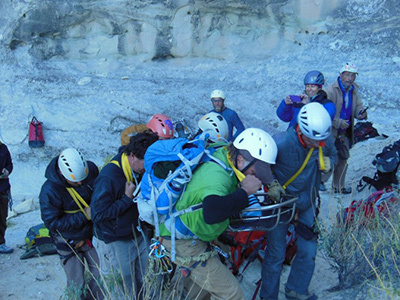 This autumn the Amangiri guides concentrated on rescue skills (for those new to the blog, AP has installed and operates four via ferrata routes and a suspension bridge located at the resort), as well as enriching their understanding of Bryce Canyon National Park and its environs. To this end, we sought out teachers whose passion and deep understanding of these subjects inspire us and present new challenges. For via ferrata rescue training we invited Renny Jackson (former supervisor of the climbing/ rescue ranger program in Grand Teton National Park) and Catherine Cullinane (the Teton’s first woman guide) to provide three intensive days of instruction. The workshop was in collaboration with the Kane County Search and Rescue Team, who are the regional first responders. Shawn King, a sargeant on the team, contributed as a guest instructor. Below, Renny directs a simulation at our rappel site. We concentrated on “pick-off” techniques which can be extremely effective when assisting an injured climber down steep terrain. This video clip shows a team of AP guides practicing a “BC Pick-Off” on the “Cave” via ferrata route. Following each practice session the guides gather for a debrief to analyze their performance; making the training a valuable team building exercise. Ropes coiled and debriefs complete, the guides head to Bryce Canyon National Park for a day of training with Gayle Pollock, Executive Director of the Bryce Canyon Natural History Association. Gayle was born and raised in Tropic, Utah at the base of Bryce’s Claron Formation (40-60 million years old). His knowledge of the region is exhaustive. Local history and geological interpretation rolls off his tongue with the fervor of a man who has dedicated his life to knowing the body and soul of a place (even on a molecular level). Any history of Bryce Country has to include a story about John Wesley Powell, leader of the famous three month exploration of the Colorado River through Grand Canyon in 1869. His surveying crews mapped the most remote topography of the Colorado Plateau, and a nearby triangulation point bears his name. We have more training planned in the coming months at both our Utah and New Mexico operations, so stay tuned for future blog coverage. Luxury encounters are built upon a foundation of deep understanding and commitment to continual improvement. It is about conversations and constant engagement.